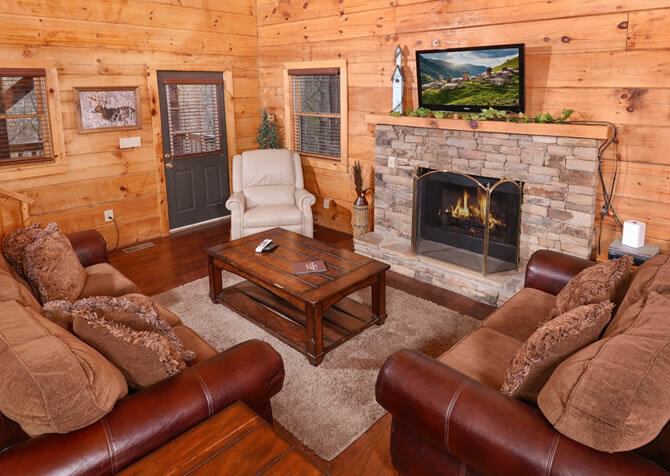 Just the right size for a romantic couple’s getaway without the kids or a small, adventurous family vacation to the Smoky Mountains, American Charm is the perfect balance of space and coziness. The open setting allows everyone to indulge in their favorite way to relax – watching TV, lounging with a book, having coffee in the kitchen…without missing out on time spent together. Reconnect during conversations with family while dad enjoys an afternoon snack at the dining room table, mom reclines on the couch with her show on the HD TV in the living room, and the kids play with the pool table. The high, exposed-beam ceiling and several large windows around the room allow light to flow throughout the dreamy cabin setting of the combined living spaces. 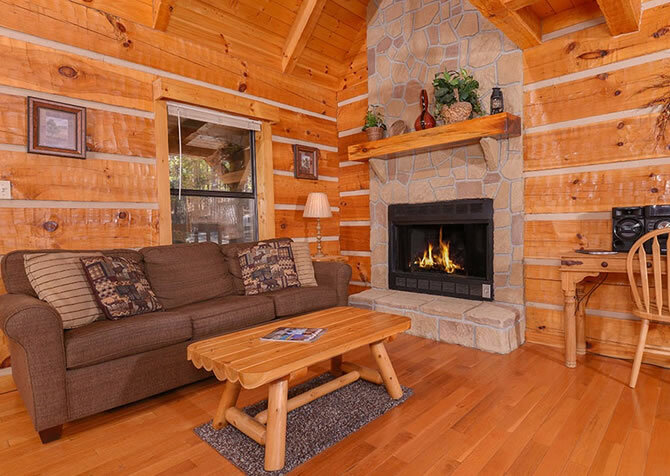 While the allure of the homey cabin is hard to leave, you will definitely want to pry yourselves away to discover hundreds of attractions in both Pigeon Forge and Gatlinburg – less than 10 miles from your cozy front porch! In town, you can make vacation whatever pace you want it to follow. You’ll find action-packed activities, outdoor fun, unique shops, hundreds of restaurants and places for dessert, spas, wineries, live music, and everything in between. On a getaway for 2, you can pick up pancake mix and stone-ground grains at the Old Mill District or visit Smoky Mountain Winery in Gatlinburg to sip on free tastings and bring home a bottle to open in the cabin for a romantic dinner for 2. On an exciting family vacation, try whitewater rafting, go karts, arcade games, miniature golf, outlet shopping, and exploring in the beautiful Great Smoky Mountains National Park. Come together in the warm light of the living room and melt into the cozy leather couch in front of the fireplace. Before getting up to unpack your suitcases, use the cabin Wi-Fi on your laptop to research the surrounding area and plan your daily excursions around the coffee table. On a cool mountain day, kick your shoes off and recline in the oversized black leather reading chair next to the stone fireplace. It’s the perfect place to sip some coffee, unwind, and crack open that book you’ve been aching to read. Or you can relax on the couch and flip through channels for a good show to watch on the HDTV above the mantel. After a lazy day in the living room and resting from your trip to the cabin, head into downtown Pigeon Forge for shopping, sweets, and tons of attractions! Visit the grocery store before heading back to American Charm for some cabin-cooked meals; it’s a great way to save money and it makes dinnertime a special experience to be shared. Lay out all the necessary ingredients from the refrigerator on the granite countertop after preheating the oven. Grab pots, pans, and cookware conveniently provided in the wooden cabinetry. After your delicious meal, store leftovers in the fridge and reheat them in the microwave later as an easy snack! Brew a warm pot of coffee in the coffeemaker after dinner before heading to the living room to have a movie night. The next morning, mosey into the kitchen to pack a lunch to carry along to Cades Cove for a picnic in the tranquility of the mountain valley and beautiful scenery of the Smokies. Gather around the quaint, wooden dining room table ideal for your small family meals or romantic dinners for 2. 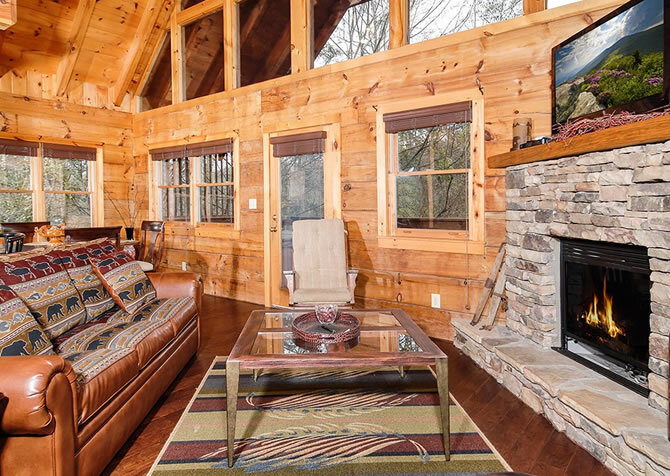 Before taking on adventurous days on the Pigeon River or the hiking trails, eat a hearty breakfast in the soft morning light drifting in from the kitchen windows at the inviting dining table on the soft bear rug. After returning from some gut-wrenching good times at the Dolly Parton's Stampede Dinner Show, keep the jokes and fun rolling with board games at the table as laughter carries late into the night. On days of rest in between local excursions, have some quality time and settle around the dinner table to put together a puzzle while reconnecting with a loved one. Rest easy in the comfort of the private bedroom in the inviting new Simmons Beautyrest pillowtop queen-size bed and rustic mountain décor. After unpacking your suitcases into the tall, dark-wood dresser take off your shoes, jump into bed, and let the cozy mountain cabin atmosphere carry away all your stresses. Click on the bedroom’s TV and enjoy an afternoon show before dozing off while surrounded by the warm, natural wood of the walls and exposed ceiling. After a much-needed nap, wake up and rejuvenate under the relaxing waters of the sleek, glass door walk-in shower that features wood-look tile. Grab a cold drink and head over to the pool table for some good-hearted competition mixed with a little trash talk! In between turns, watch the football game on the living room TV or grab a handful of snacks from the dining room table. With the open floor plan of American Charm, you can enjoy a solo game of pool and still hang out with family as they play board games at the table or relax on the living room couch. While everyone else is out shopping, read a book in the perfect lighting shining through the window next to your cushioned rocking chair beside the pool table. You will find unloading the car easy in the flat gravel parking area with just a few steps to climb to the front door of the homey wood cabin. 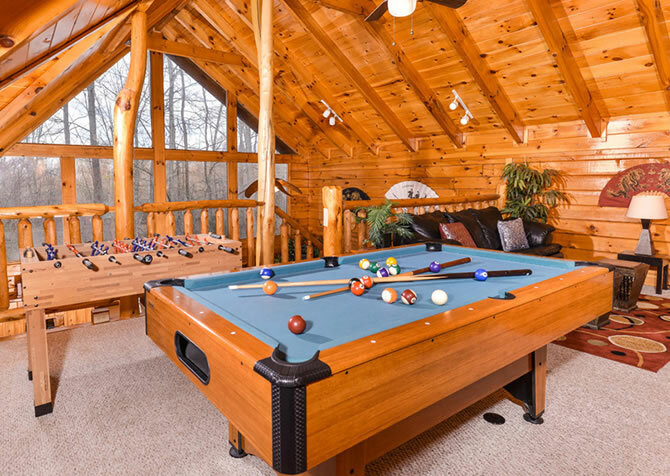 After arriving to your humble mountain abode, change into some swimwear and begin your relaxing time in the Smokies with a dip in the soothing bubbles of the outdoor hot tub on the back deck! While dining out in Gatlinburg and Pigeon Forge is always fun, you can grill up some food on the charcoal grill for a cookout on a nice night outside. Enjoy some uninterrupted quality time as you and your loved one sway together in the rocking chairs with only the sounds of wildlife and rustling leaves drifting through the air. After brewing your morning coffee, get some fresh air on the front porch in the early light as another exciting day begins in the Smoky Mountains. 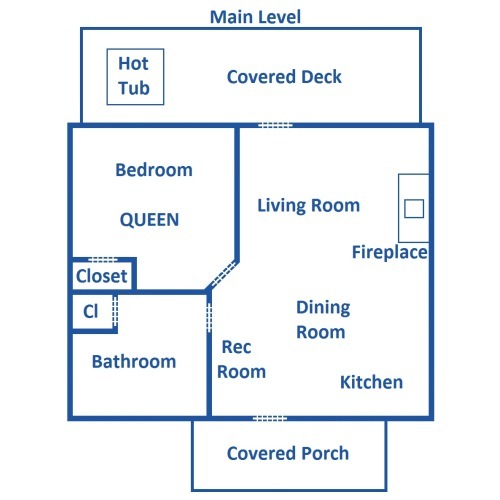 You'll also have a washer/dryer for your convenience! Fly through acres of rolling mountains and beautiful forests on 4.5 miles of zip lines over 400 feet off the ground! Visit Legacy Mountain Zip Lines in nearby Sevierville, Tennessee, for the most thrilling sightseeing of the beautiful Smoky Mountains. With experienced guides, eco-friendly zipline courses, and breathtaking views, ziplining will be everyone’s favorite Pigeon Forge excursion! Escape the norm and discover curious delight and entertainment in the 19th-century-style music hall of the Sweet Fanny Adams Theatre. Here, boisterous, hilarious, and original musicals have been on display for over 30 years! As the only entertainment of its kind in Gatlinburg, sit back and enjoy the show as the dark red classic curtains part and the critically-acclaimed talents sing, dance, and entertain every emotion! The family is sure to enjoy a classic game of putt-putt golf with extra interactive twists and gorgeous views of the Smokies as the backdrop. Choose between two 18-hole courses with different themes and unique obstacles. By trickling creeks and past interesting characters, putt your ball through all 18 holes for fun-filled family time in Gatlinburg! "American Charm was the perfect size for 2 people. Location was close to both Pigeon Forge and Gatlinburg, but far enough away to enjoy quiet time . This cabin does have a washer & dryer which I was unaware of before arriving, The mattress was…"
"American Charm was the perfect size for 2 people. Location was close to both Pigeon Forge and Gatlinburg, but far enough away to enjoy quiet time . This cabin does have a washer & dryer which I was unaware of before arriving, The mattress was a little on the firm side for us, but didn't ruin the stay. The cabin was very clean and had everything you would need. Bring extra towels and washcloths if you are staying longer than a couple days or bring detergent to wash them. Traffic was a little loud at times since the cabin is close to a main road, but nothing that would make me not go back to this cabin. All information was given to us in a timely manor, check in and out was a breeze. No issues at all. This was a long weekend getaway for us and it was excellent. Thank you Cabins for you!! " We are thrilled to hear how much you enjoyed your memorable stay at American Charm! It was our absolute pleasure to serve you, and we look forward to serving you with an even more incredible Smoky Mountain stay in the future. "The cabin was very nice and cozy. It had all the space needed and was reasonably close to town if you forgot anything. We loved the outdoor hot tub. Thanks Cabins for You!"